Tote: I think it is nice to have a tote to be able to carry down to the beach or to the pool. Fill it with sunscreen, a towel, your favorite book, and a water bottle that way you have everything you need all in one place and can just enjoy time on the beach without having to run back to the place you are staying over and over! Long Sleeve Stripe Tee: Most likely there will still be some chilly nights or days wherever you are going especially since it is just the beginning of spring. I think its great to just have a simple long sleeve tee that you can throw on with some shorts and look cute but still stay warm! Cover Up: A cover up is an essential to wear down to the beach or pool to cover up your bathings suit and help keep you a little warm. I know a lot of people just like to wear t-shirts, but if you prefer more traditional coverups like me, this one is super cute! I love the eyelet paired with the pom poms. Sandals: Sandals are a must have; in my opinion, Palm Beach Sandals are the ultimate choice. You can wear them down to the beach, but they also look super cute if you're going out to dinner or wandering around the town. They are versatile, and a metallic color like gold will go with everything! Shorts: Chino shorts are pretty much the only shorts I wear during the summer. I always stock up on the fun new colors each year, and I love this green color! It would look so great with a navy or white top. They are comfy and cute, and the best shorts to wear for any occasion. Bikini Top: Obviously a bathing suit is a necessity for the beach, but I thought I would share my favorite that I have found. I love this bikini top! It is colorful and fun and, therefore, makes a statement. Plus, it isn't very expensive! Hat: A hat is perfect to help keep the sun off of your face, and a super cute one like this one from Vineyard Vines will help you look super cute. You can wear it while lounging around on the beach in a bikini, but also when you are heading out paired with some shorts and a tee. Obviously, these aren't the only things that you need, don't forget your favorite summer dresses, sunglasses, your favorite book, and some tank tops. I hope you all have a fun and safe spring break! Let me know where you are headed. 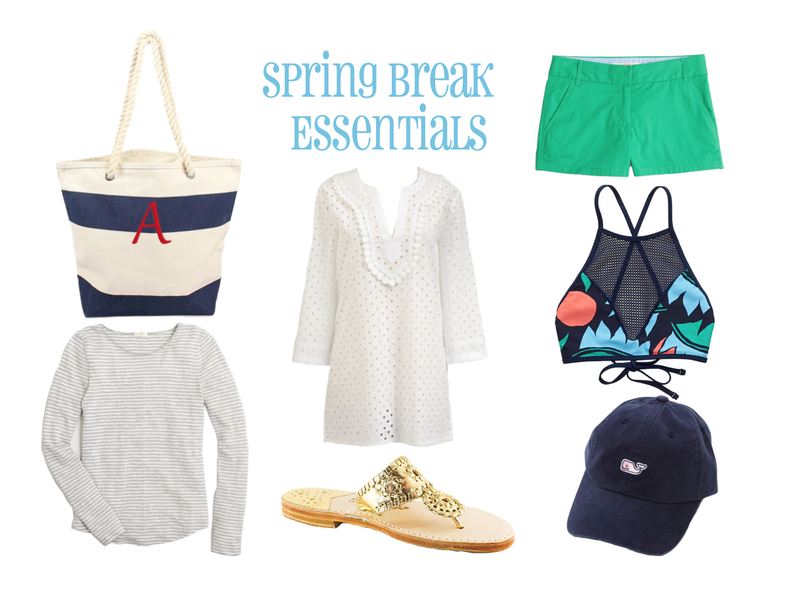 Also, would you all be interested in seeing what I pack for my spring break?